While Jet Airways has in its almost 26 years of existence ridden through – and survived – a number of rough patches, sector watchers see the carrier’s current run as its most turbulent yet. On Friday, March 22, Jet Airways’s share ended trading 3.6 per cent higher from its previous close at Rs 225.85 on the Bombay Stock Exchange. In an industry as volatile as aviation, 12 years can be a long time. Long enough for Jet Airways’s descent from being one of the most preferred airlines with offerings that matched those of top-rated international carriers to one that’s fighting for survival. 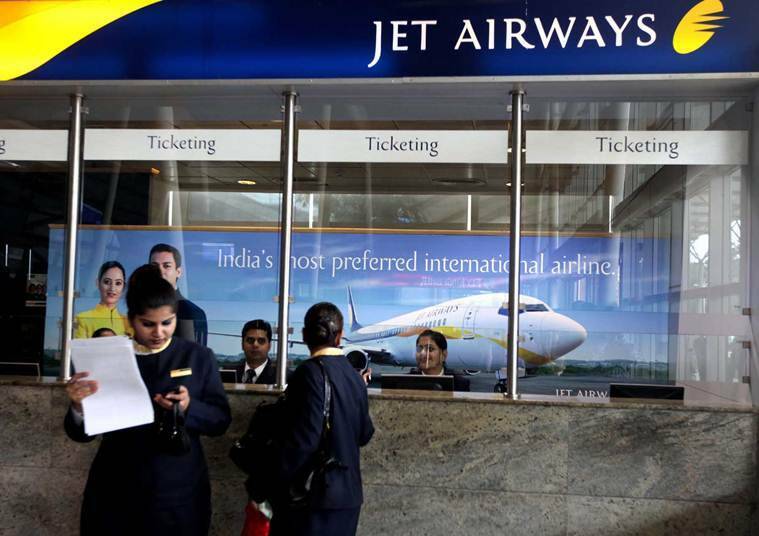 According to a report of the Directorate General of Civil Aviation (DGCA), for February 2019, Jet Airways, along with JetLite, the company’s wholly owned subsidiary, received the highest passenger complaints at 3.1 per 10,000 passengers. These complaints are over a number of issues such as fares, refunds, flight delays and cancellations, baggage handling, etc. Next on the list was Air India (domestic) with 1.5 complaints per 10,000 passengers. While Jet Airways is not the only airline to bear the brunt of macro factors such as high fuel prices and a depreciating rupee, analysts say the carrier’s high debt levels and failure to raise funds have landed it in trouble. Though the airline has managed to rein in its costs over the past few quarters, its survival now rests on whether it finds a new investor. While the airline has in its almost 26 years of existence ridden through – and survived – a number of rough patches, sector watchers see the carrier’s current run as its most turbulent yet. Today, the airline is facing a crisis of confidence among its various stakeholders – faced with frequent disruption and complaints, its passengers are looking at other airlines; its pilots are interviewing for jobs with rivals; aircraft lessors are in discussions to take back planes rented to Jet so that they can be leased to other domestic carriers; and its shareholders are looking to offload Jet’s stock. With the future of Jet’s 17,000 employees tied to the airline’s survival, efforts are being made at the highest levels of the government to ensure there are no job losses ahead of what is being billed as a defining election. “In a situation where market forces are left free, it is healthy if an airline or an airport goes bust. It weeds out inefficiencies. But Jet is a large player and there are 17,000 families associated with it,” said a senior government official who is in the know of plans pertaining to Jet’s future. The story of how the airline set itself on this course, and how it managed to remain airborne while competitors came and left the scene, dates back to the 1970s, when a young Naresh Goyal, then working at his uncle’s travel agency in Delhi, learnt the ropes of the trade. Later, in 1974, he started his own agency, Jet Air, a stint that exposed him to the global travel business. It was only after the government opened up the country’s economy and its skies in the early 1990s that Goyal was able to work towards launching Jet Airways, one of the first private airlines in India. In 1993, a year after its launch, Jet got its permit to fly as an air-taxi operator, which meant that it could fly but without a schedule. In 1993, a year after its launch, Jet got its permit to fly as an air-taxi operator, which meant that it could fly but without a schedule. (A flight schedule allows a carrier to estimate costs and revenues for six months, the period of a single schedule in India.) Among the first flyers on Jet’s maiden flight from Bombay to Ahmedabad on May 5, 1993, was the pioneer of Indian aviation, J R D Tata. Less than two years later, Jet Airways got the go-ahead to fly as a scheduled airline. This was made possible because the government had by then abolished the Air Corporation Act, 1953, which gave monopoly to State-owned carriers to operate as scheduled airlines. 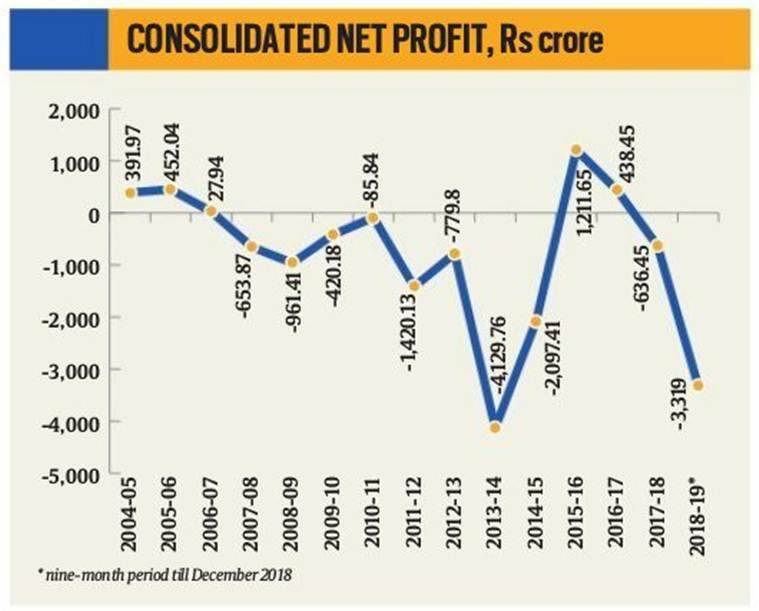 Over the next few years, as Jet Airways started full-fledged operations, it grew to become the poster boy of private sector efficiency in India. Though the government’s Open Skies policy of 1992 — which called for the liberalisation of the rules and regulations of commercial aviation to create a free-market environment for the airline industry — coupled with the repeal of the Air Corporation Act, meant that the skies opened up to other private players such as ModiLuft, Air Sahara and East-West Airlines, Jet stood out from the pack. Until 2015-16, it paid among the highest salaries, spending Rs 67.04 lakh annually on each of its pilots. While ModiLuft and East-West ceased operations in 1996, Jet acquired Air Sahara in 2007. Over the years, as the founder-chairman of Jet, Goyal was able to foster relationships across the international aviation community and also managed to leverage some of these during times of trouble. While Jet continued to grow over the 1990s and early 2000s, in 2004, another change in government policy came as a boon for private carriers. In December 2004, the Union Cabinet approved a proposal of the Ministry of Civil Aviation to allow “eligible” Indian scheduled carriers to operate on international routes. “Only Indian scheduled carriers with a minimum of five years continuous operations and having minimum of 20 aircraft in their fleet will be allowed to operate on international routes,” read the official statement dated December 29, 2004. With about a decade of flying under its belt, Jet benefited immensely from the policy, which came to be known as the “5/20 rule” and which served to keep its relatively younger competitors such as the now defunct Kingfisher Airlines and Air Deccan out of international operations. In March 2004, Jet Airways and Air Sahara both launched their first international flights on the same route — Chennai to Colombo. In 2016, however, the government scrapped the 5/20 rule, which had been opposed by every new airline in India. Over the years, as the founder-chairman of Jet, Goyal was able to foster relationships across the international aviation community and also managed to leverage some of these during times of trouble. One such relationship was with the Abu Dhabi-based carrier Etihad Airways, which, aided by relaxed FDI rules, picked up stakes in Jet. Goyal currently owns a majority 51 per cent stake in the airline, with Etihad holding another 24 per cent. 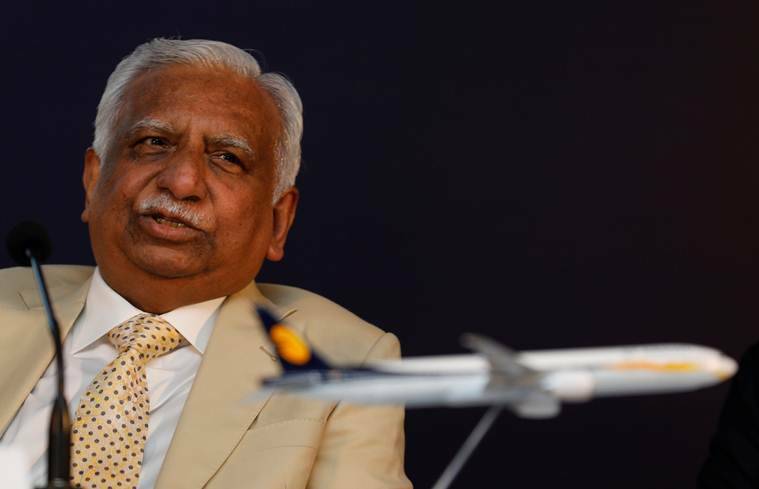 “You should never write off Naresh Goyal,” a senior official in the Civil Aviation Ministry had told The Indian Express last month, around the time that discussions at Tata Group on picking up stake in Jet Airways had gained serious momentum. “He has seen this airline through various seasons and he won’t let it go down without a fight,” the official had said. Despite this optimism, many agree that this time round, Goyal will have to pull off a near miracle to survive this storm. 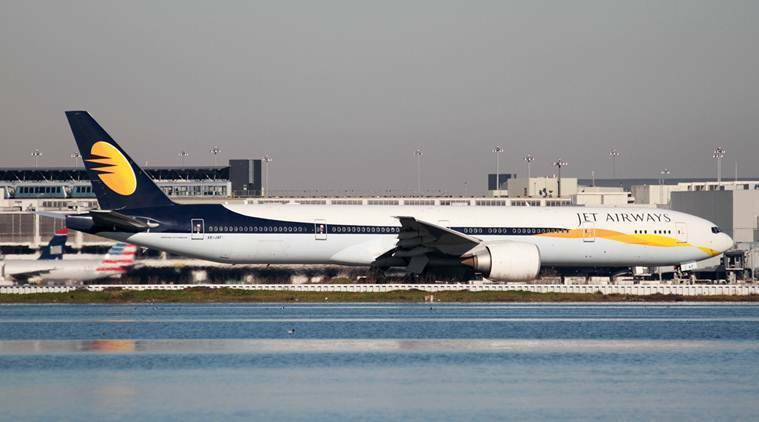 On Friday, March 22, Jet Airways’s share ended trading 3.6 per cent higher from its previous close at Rs 225.85 on the Bombay Stock Exchange. But this was a steep fall from February 2005, when its initial public offering, which was priced at Rs 1,100 a share, was subscribed 16.2 times with participation mainly from retail and large domestic and foreign institutional investors. Jet Airways founder Naresh Goyal. With an average yearly growth of 20 per cent in the last four years, India’s aviation market is among the fastest growing in the world. What then explains Jet’s rapid descent? Industry watchers say Jet’s troubles can be attributed to a combination of factors, among them its acquisition of the debt-ridden Air Sahara in 2007; the carrier’s inability to raise funds in troubled times; steady losses in the wake of higher fuel costs and a weaker rupee; and a growing market for low-cost carriers that affected the profitability of a full-service carrier like Jet. Starting with Air Deccan, India’s first private budget airline, in 2003, the subsequent years saw the launch of several airlines such as SpiceJet, IndiGo and GoAir, a low-cost model that revolutionised the Indian skies. This meant that Jet, which until then had a near monopoly over the skies, now had to compete with players offering cheap and unbundled fares that caught the fancy of new air travellers. In 2003-04, Jet Airways enjoyed a domestic passenger market share of 44 per cent, but gradually, the airline started ceding the ground it had once won from Air India. 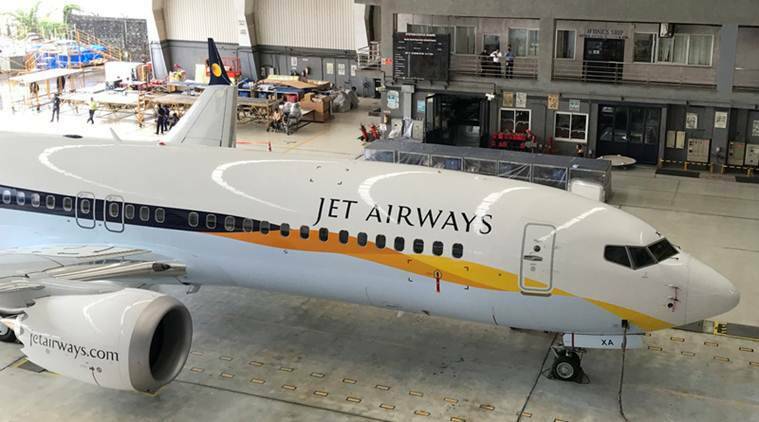 By 2005-06, Jet’s market share fell to 36 per cent and the following year, while still being the leader, Jet’s standalone market share fell to 27.7 per cent. According to DGCA data for February 2019, at a market share of 10 per cent, Jet Airways had dropped to the fourth place, behind IndiGo (43.4%), SpiceJet (13.7%) and Air India (domestic, 12.8%). It doesn’t help that this is a challenging cycle for the aviation industry, the second such in the last decade after 2013-14. High crude oil prices, which breached the $70 per barrel mark in June 2018, coupled with depreciation of the rupee against the dollar, and intense competition among airlines have hit the bottomline of most carriers. In February 2019, Jet Airways reported its fourth consecutive quarterly loss of Rs 587 crore for the three months ending December 2018. In the three previous quarters, it had reported losses of Rs 1,261 crore, Rs 1,297 crore and Rs 1,323 crore. However, it was not just Jet that suffered financial blows during this period. High crude oil prices, coupled with depreciation of the rupee against the dollar, hit the bottomline of most airlines. Market leader IndiGo too reported a loss of Rs 652.13 crore for the September-December quarter, its first loss since becoming a publicly traded company in 2015. But analysts believe that it was Jet’s acquisition of Air Sahara that proved to be the tipping point. The company bought the Sahara airline for Rs 1,450 crore and converted it to a low-cost carrier under the JetLite brand, hoping to enjoy a lower cost base than competitors by leveraging group facilities and services. Industry insiders say this was a “brazen” move by Jet, an attempt to hold market leadership, that cost it the comfort of liquidity on its books. “Sahara had a good product but was in a financial mess. Why did he (Goyal) acquire Sahara (Airlines)? Because he still wanted to be the biggest in the market after the entry of Kingfisher (Airlines). But eventually, it was for the consumer to decide. And then, IndiGo came in 2007, which gave you the most basic commodity, a seat, which was clean and new. IndiGo made it clear that it is the seat for which you pay, everything else is add on,” says Mark Martin of aviation advisory firm Martin Consulting. But what probably made it worse for Jet was its inability to raise fresh funds. Even Etihad, Jet’s Gulf-based partner which had bailed out the carrier in 2013, is unwilling to infuse more funds into the ailing airline until Goyal relinquishes control. Despite Goyal’s appeal, the delay in salary payments across roles has made the staff desperate for a turnaround. The airline’s pilots have threatened to ground themselves starting April 1 if their salaries are not cleared by March 31. Hundreds of Jet’s 1,000-odd pilots are approaching rival airlines for jobs. Earlier this month, the airline’s ground staff crowded its Mumbai headquarters seeking a roadmap to recovery. With Jet struggling, there are the inevitable comparisons to Kingfisher, the airline that went belly up in 2012. And worryingly for the industry and lenders, there are several similarities. Like with Jet Airways now, bankers had decided to swap Kingfisher’s debt to equity, though they were unable to recover their dues. A chain of events involving aircraft grounding, unpaid salaries, flight cancellations and banks infusing funds occurred before Kingfisher’s eventual demise. “After the Kingfisher episode, there are few (investors) who want to touch this (Jet Airways),” said the senior government official who is closely involved in negotiations over Jet. 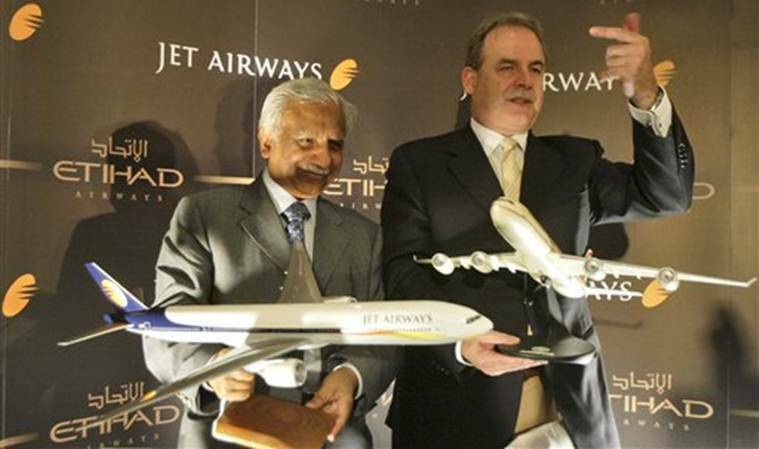 It is learnt that at a meeting with State Bank of India last week, Etihad CEO Tom Douglas offered to offload its stake in Jet Airways. “As we have consistently maintained, as a minority shareholder, Etihad is working closely with Indian lenders, the company and key stakeholders to facilitate a solution for Jet Airways,” Etihad said in response to a query sent by The Sunday Express. While a part of the decision to exit Jet is being attributed to Etihad itself not being in sound financial shape, it’s also true that the Gulf carrier’s investment in Jet has suffered, having come down to less than a third. In 2018, Etihad Airways reported a loss of $1.28 billion, the third straight year the government-owned carrier lost over a billion dollars. On February 14, Jet Airways’s board of directors approved a bank-led provisional resolution plan that currently estimates a funding gap of Rs 8,500 crore (including proposed repayment of Jet’s aircraft debt of Rs 1,700 crore) to be met by an appropriate mix of equity infusion and debt restructuring, among other things. Jet Airways did not respond to queries sent by this newspaper. Though it’s uncertain how things will play out, what’s urgently needed for Jet’s survival is an immediate infusion of funds to pay salaries, service debt and pay dues to lessors. Jet’s lessors, who have been the airline’s long-term partners, are now beginning to apply for de-registration of grounded planes, which have been pulled out of service due to non-payment of lease rentals. Only 41 of the 119 aircraft in Jet’s fleet have been operational. The problems with Boeing’s 737 MAX aircraft, and its global grounding, have got carriers with the US-made aircraft to urgently shop for other planes. In India, SpiceJet, which has 12 737 MAX planes, is learnt to have been negotiating with Jet’s lessors to induct some of its grounded aircraft. “Lessors are panicking because if Jet goes into insolvency, their aircraft will be stuck in India,” said a SpiceJet official. Banks that are a part of the consortium of Jet’s lenders are learnt to have asked several of the airline’s directors, including Naresh Goyal and his wife Anita Goyal, to step down from company’s board. The government has indicated its resolve to save the airline and has, in fact, kicked off a process to bring in new investors. Months ago, talks of the Tatas picking up the airline had floundered on Goyal’s reluctance to cede management control but now that it has been put as a precondition by the banks, the Tata Group may be back in the race. Meanwhile, Jet’s workforce waits and watches uneasily.